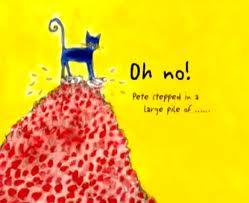 Over the weekend, I read a completely charming and adorable picture book called Pete the Cat: I Love My White Shoes. I had never heard of it, so when my daughter asked to read it to me, and my friend said it was great, I sat back and listened. Its language is simple, perfect for early readers and the message is strong, perfect for kids of all ages. Pete is a cat who likes his shoes, which start out white. 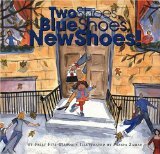 As the book progresses and Pete steps into some different things, such as strawberries, blueberries, and mud, his shoes change colors. Though the message is clear throughtout, I love that the story ends by telling the moral of Pete’s story. No matter what color your shoes or what happens, go with it; carry on and be okay. The multicolored shoes, of course, can be substituted for a wide multitude of things. People often see picture books as a way to engage young children, but their message can be very important to older children as well. In fact, sometimes, the simple but powerful messages in a picture book can be more meaningful than a long novel, particularly for struggling readers. Even for strong readers; who are used to making sense of text, finding connections, predicting, and summarizing. Ask them to give you the moral and key points of a picture book and they often get stumped. They stopped reading such books when they were around eight or nine so now, to them, those books are for little kids learning to read. They forgot, or don’t see, the message that is embedded in most pictures books and young children’s tales. Taking them back to those stories and seeing what they pull from it, is a true delight. Every kid loves to be read to. My grade five class, whom I read to almost every day, was asked by our librarian if they wanted to hear a story. There was a resounding yes. They all sat on the carpet in front of her rocking chair, listening to her animated voices. They did exactly what we want kids to do; they fell into the story. They engaged and enjoyed. They saw the moral and the next day, when they did their writing, the book was mentioned more than once. Picture books are powerful tools, regardless of a person’s age. This is why, at the workshops I attend, there are frequently picture books used to share and show strategies and ways to improve reading levels. Picture books connect; they draw you in and charm you in a short amount of time. You can never be too old for that.